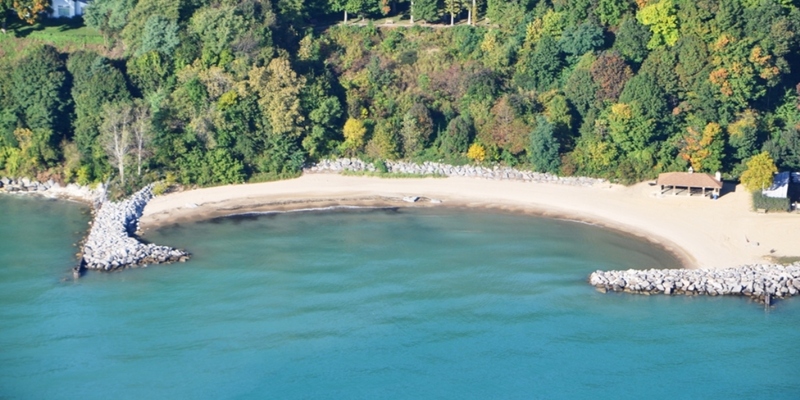 Accessing Lake Michigan from this private residence used to be nearly impossible. A dilapidated metal staircase provided access down the bluff, but access to the lake was impeded by concrete surgebreakers. After renovation, the bluff is now a northshore showstopper. 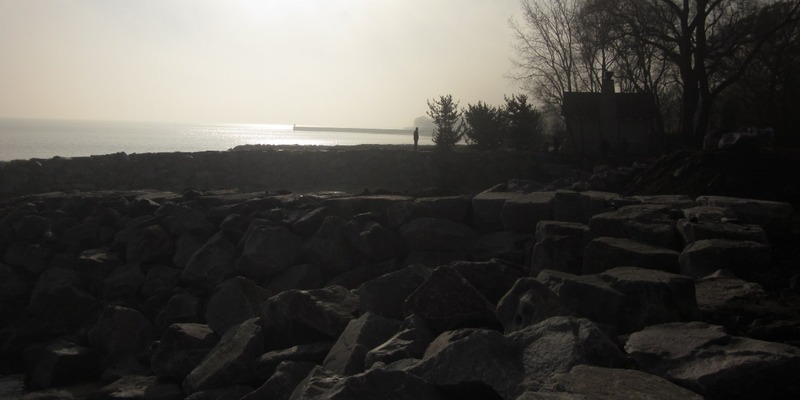 The concrete barriers were removed, creating access to Lake Michigan, and the shoreline is now protected by a quarrystone revetment. 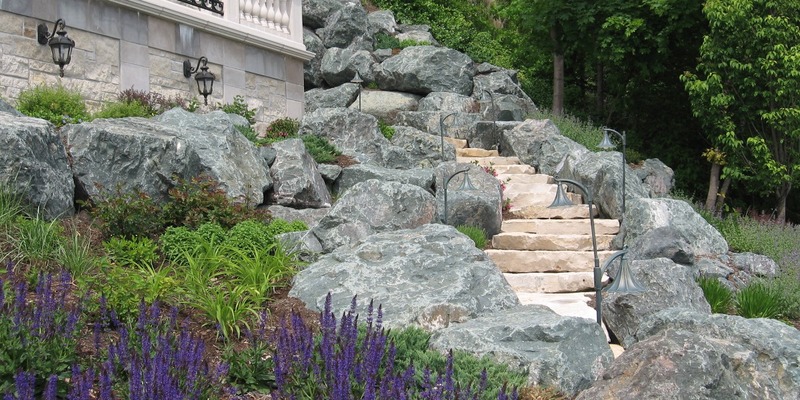 Beautiful stone stairs provide access down the landscaped bluff. 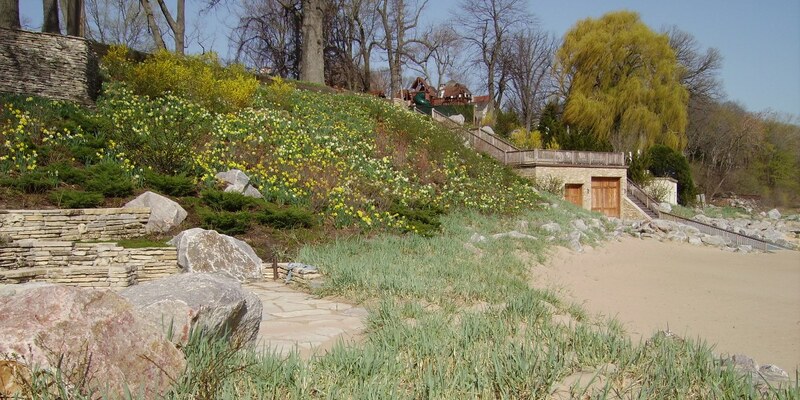 At one time, Lake Bluff’s Sunrise Beach Park was highly erosional. 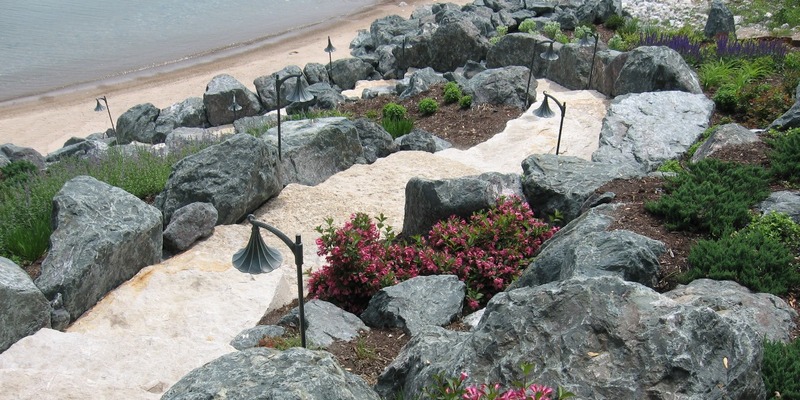 Using coastal engineering and native vegetation, Shabica & Associates designed a low-impact shore protection system that included quarrystone breakwaters to form a bay beach. 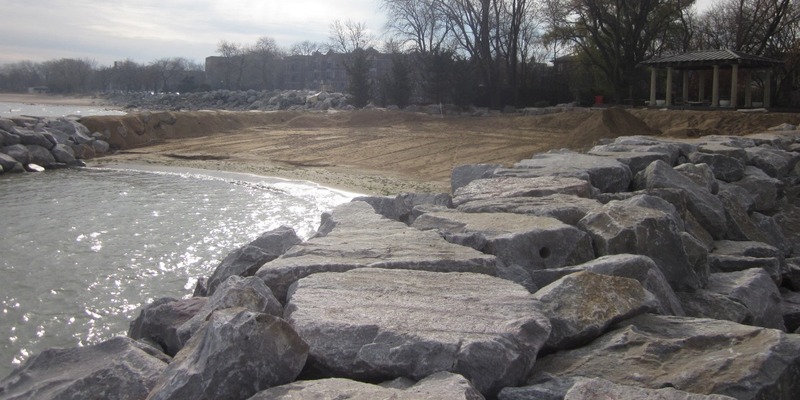 This restoration effectively returned the beach to the residents of Lake Bluff. 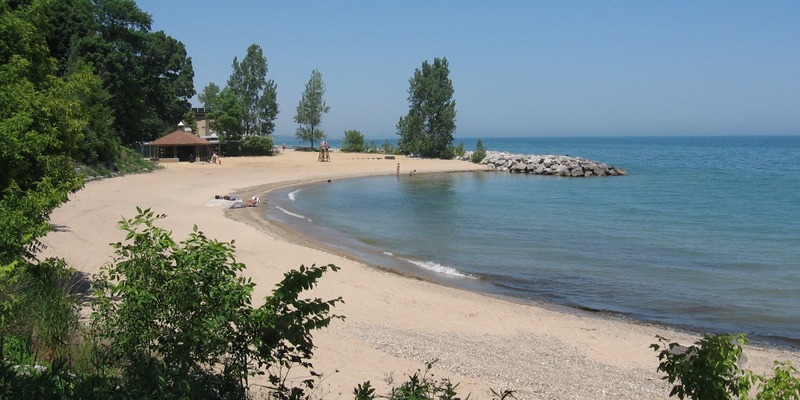 In 2004, Sunrise Beach Park was named Top Restored Beach by the American Shore & Beach Preservation Association, and in 2013 was just awarded the Best Great Lakes Beach by ASBPA! Visit the Lake Bluff Park District website for more information on Sunrise Park. 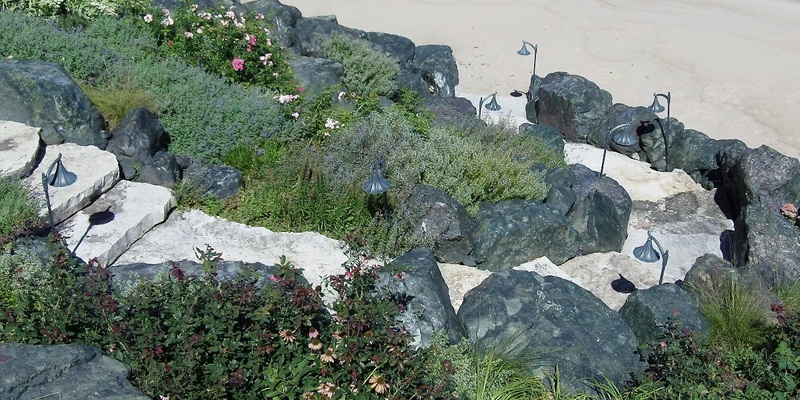 The base of the bluff at this private residence in Highland Park was restored to provide better stormwave protection, as well as more serene environment, after a revetment was built that incorporated native vegetation. The lakefront here also includes a bay beach, a boat house and a patio. 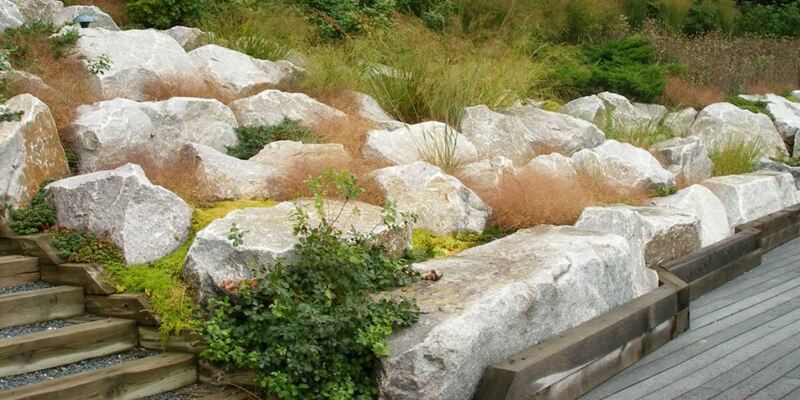 Shabica & Associates worked hand-in-hand with the landscape architect to create the perfect lakefront retreat. 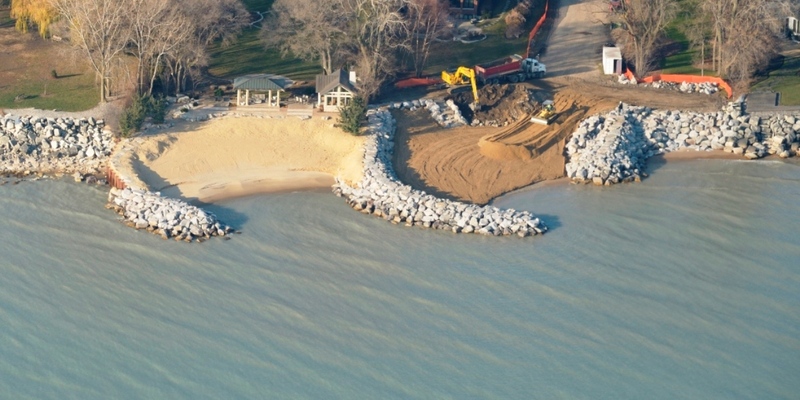 Three adjacent homeowners in Evanston combined forces by enlisting Shabica & Associates to design two side-by-side bay beaches. 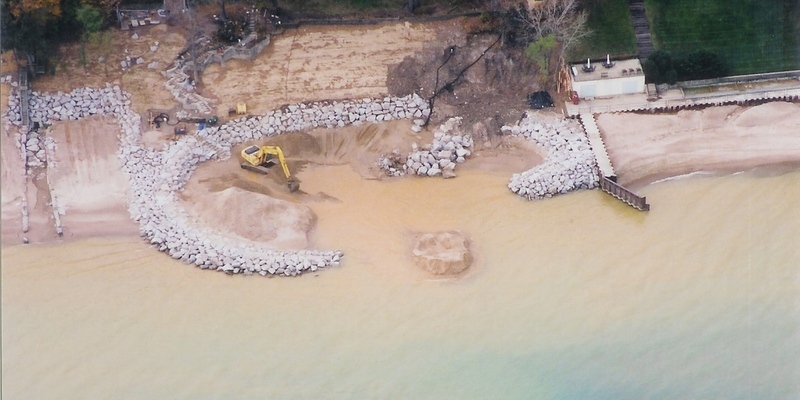 As these properties were formerly protected by steel sheetpile seawalls and deflated concrete rubble revetments, lakefront access was created for the first time. 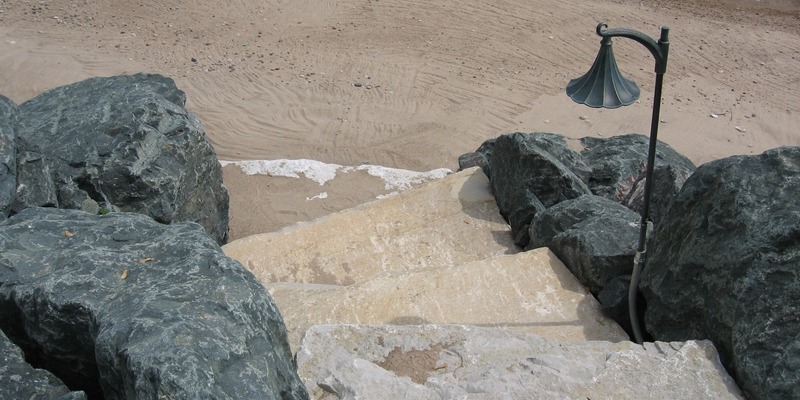 The project included construction of a quarrystone revetment across all properties (with stone steps incorporated into them to provide pedestrian access), and two bay beaches. The project is now an Evanston showstopper. 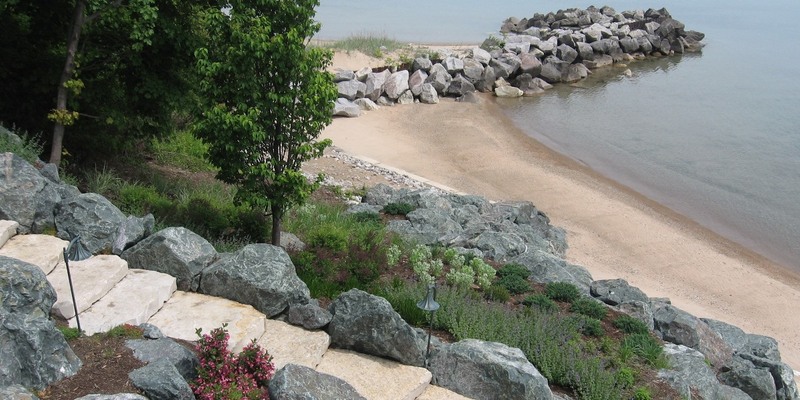 The lakefront at this private residence was completely transformed after the construction of a breakwater-protected bay beach, as the property formerly had no public access to Lake Michigan. 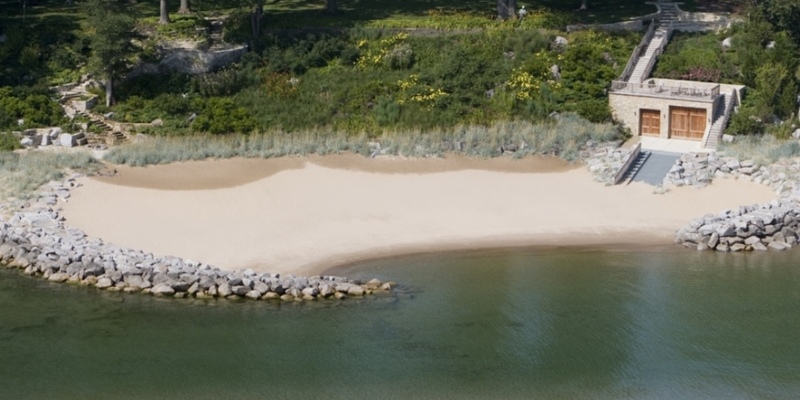 The project included construction of a quarrystone revetment, two flat-topped breakwaters, stone steps, and the addition of a boat house and a boat ramp to help increase the usability of the beach and lakefront. 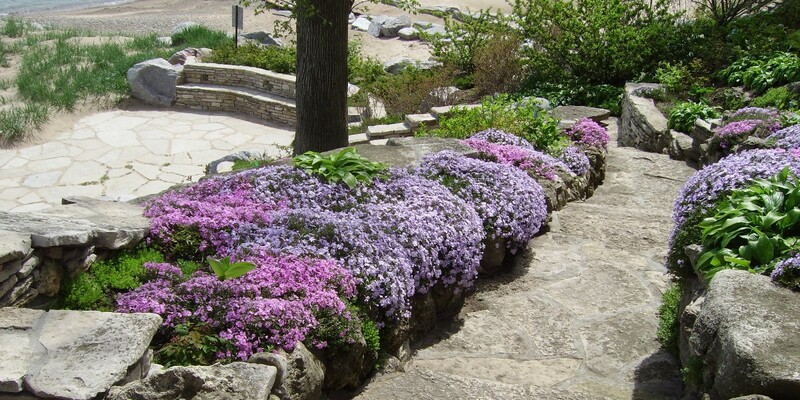 The beautiful winding stairs down the bluff were renovated from the property’s original Jens Jensen stairs. 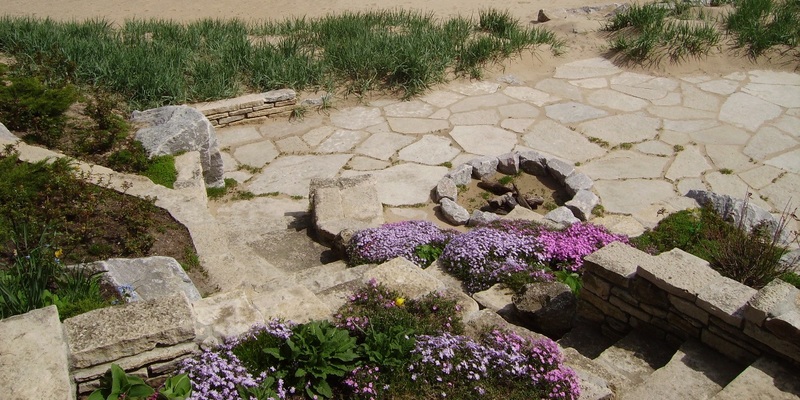 The native prairie and beach grasses helped restore what was an unsightly bluff devoid of quality vegetation. 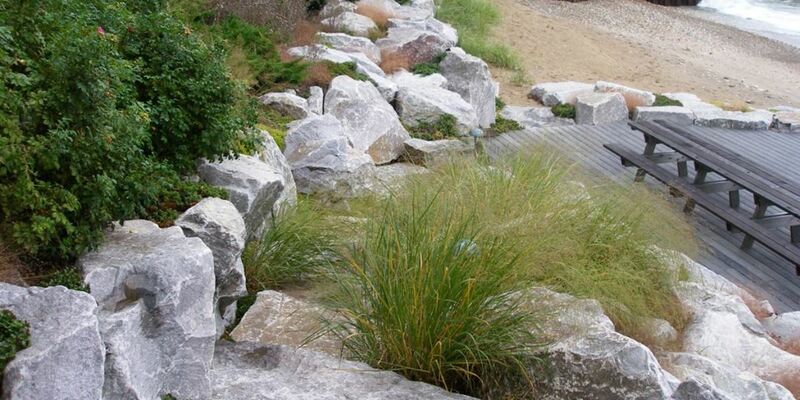 Working closely with the landscape architect, Shabica & Associates approached the bluff restoration, breakwater design, revetment, vegetation and beach as integral elements with each part crucial to the success of the system.